Brilliant hostel and the host gyoko is an amazing guy who really looks after you. He let me use his own bike for no charge and also drove me to Berat as well. If you’re planning a trip to Ohrid make sure you stay here, can’t recommend this hostel enough. The location in the old city was perfect to navigate around the city. The staff is so helpful and took extra time with people to answer questions and do extra requests. This was much appreciated by me. He took me to the airport to catch my flight back so my trip was without worries. I loved staying here! The guy who runs it is super friendly and helpful! The porch is perfect for chilling in the mornings. Flawless. And comfiest beds I’ve slept in so far in the Balkans. Place was choice as. Guy running the place was an absolute lad! 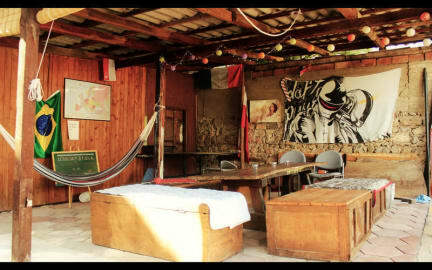 One of the best hostels I have stayed at. Big lockers, heating in the room, cleanliness everywhere, well-equipped spacy kitchen, balcony with beautiful view. Another balcony to dry clothes. Maybe the only thing wanting is heating in the kitchen and the bathroom. The unlimited supply of free hot tea was very much appreciated. :) Not to mention the free plentiful continental breakfast. The staff is super efficient and friendly and ready to answer all your questions and provide lots of information. All is good. If you prefer calm room during night, you may have a better option. Owner is dry friendly and is glad to share all info with you. Location is good as well. Few mins walk you can reach many tourist sites. Kiki was super friendly & helpful with when buses ran & where to see great things in ohrid. The rooms were super clean & tidy. No reading lamps though. The bathrooms are showing wear - one without toilet seat. Great balcony with morning sun. Small kitchen to service all who stay - can get crowded in the mornings. Simple self serve breakfast - bread, pastry, spreads, cereal. We're very pleased with our stay in a private room. But it was really cold and not always hot water. It was pretty loud and almost no sound isolation. Really nice and helpful staff, thank you!